I got the idea and ingredients for this recipe from Alicia Silverstone's book The Kind Diet, but my motivation to make the crumble was so urgent, that I did not read the instructions and created an entirely different "crumble", actually much closer to the German "Streusel". Therefore I want to encourage you, just as I did, to be very liberal with Alicia's instructions (to find here), and of course the suggested quantities and measurements may be adjusted to your pleasing. 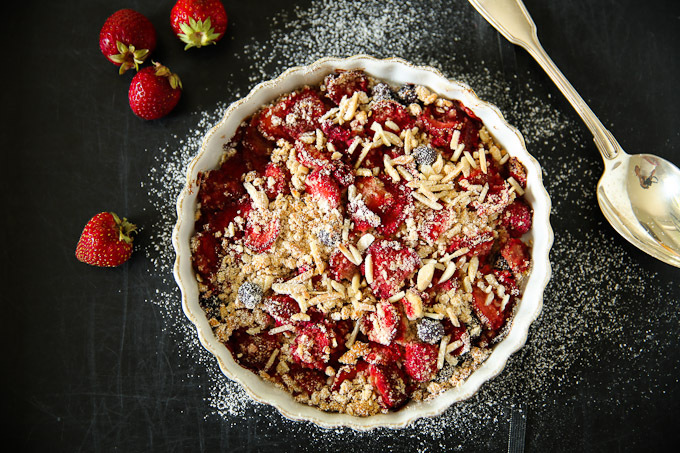 Combine the fruit and the crumble in a baking pan. Bake it in the oven at 180° until the fruit bubbles and the crumble turns golden. Enjoy!